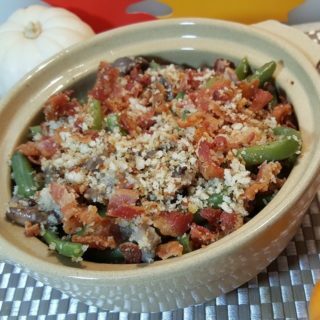 Instant Pot Green Bean Casserole with optional Crispy Bacon Topping, is made with fresh ingredients and will brighten up your Holiday table. 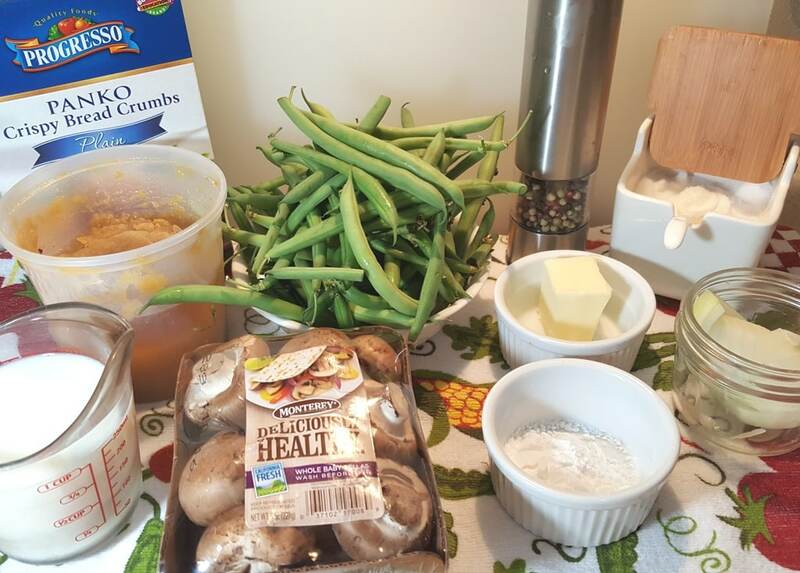 Do you loathe Green Bean Casseroles? I do. 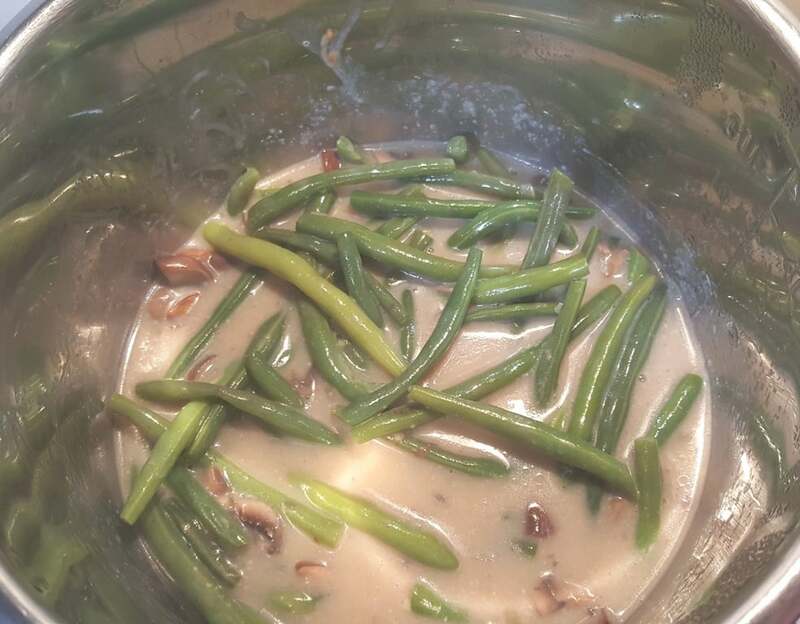 Canned green beans and a can of cream of mushroom soup and then oily fried onions on top? Yuk, turns my stomach. I like fresh ingredients! I remember the first time I ever tasted a Green Bean Casserole and thought it was horrible. Between the Canned Cream of Mushroom Soup and the canned, greasy crispy onion pieces, yuk. To those who like it, sorry if I offended you. . . . I just can’t do that canned stuff. Perfect for Christmas, Thanksgiving, Easter and everyday, this recipe is simple to make. Fresh is the way I roll. This can be made on the stove top, in the oven, in the Air Fryer or in the Instant Pot, Mealthy MultiPot or Pressure Cooker. My preference for mushrooms are the Cremini Mushrooms, also called Baby Bella’s, which are just baby Portobello mushrooms. If you like the plain White Button mushrooms, go for it. I like the flavor of the Cremini best in this dish. You can easily make this vegetarian by using Vegetable Broth, instead of Chicken Broth/Bone Broth, if you like. As the title says, the Bacon is optional. 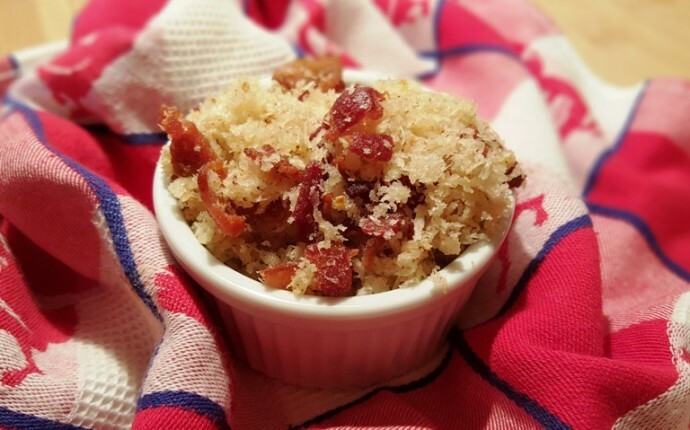 If you don’t want to use Bacon, when you make your Crispy Bacon Garlic Breadcrumb Topping, don’t add bacon to the Instant Pot, Mealthy MultiPot or Pressure Cooker cooking pot. Instead, add the onions for a Crispy Onion Garlic Breadcrumb Topping for the Instant Pot Green Bean Casserole. Canned fried onions are so oily and taste rancid. The homemade crispy onions for the topping are so much better. This Crispy Bacon Garlic Breadcrumb Topping is so delicious and we use it on my Pressure Cooker Fully Loaded Macaroni and Cheese and on Pressure Cooker Butternut Squash Pasta recipes. While your Instant Pot, Mealthy MultiPot or Pressure Cooker is heating up, prepare the vegetables. The pot will become non-stick when you add the fat/oil to a hot stainless steel pot. Rough chop the mushrooms. Either slice them or chop them. Do whatever you prefer. I like to rough chop them. Remove the tips of your string beans. Dice up the onions. If you are making the Crispy Bacon Garlic Breadcrumb Topping without the Bacon, set the onions aside. We will crisp up the onions when we make the Crispy Bacon Garlic Breadcrumb Topping instead of the Bacon, so that you will have a crunch on top. That is just an option. You certainly can follow this recipe and just make the topping without the Bacon. Whisk together the cream and the seasonings and set it in the refrigerator for now. Use coconut flour in place of potato starch. For the topping, replace bread crumbs with crushed pork rinds. Now that your chopping and soup making is out of the way, let’s begin to cook. It is always important to heat a stainless steel pot completely before adding in any type of fat or oil. This will make the pot naturally non-stick. So, using the Sauté or Browning button on your Instant Pot, Mealthy MultiPot or Pressure Cooker, allow it to fully heat. Add a swirl of Coconut Oil, Homemade Ghee or Extra Virgin Olive Oil (or any oil that does well with higher heat) and then add the butter. This way, we will get the flavor of the butter, without worrying about it burning. Begin to sauté onions. They will start to become opaque and the pot will start to become dry. Add in about a quarter cup of vegetable or chicken broth (or water) and continue sautéing the onions. Once the onions are soft, add the mushrooms. Sauté the Mushrooms until they are cooked. Mushrooms cook very quickly, yet they are very forgiving and it is hard to over cook a Shroom. 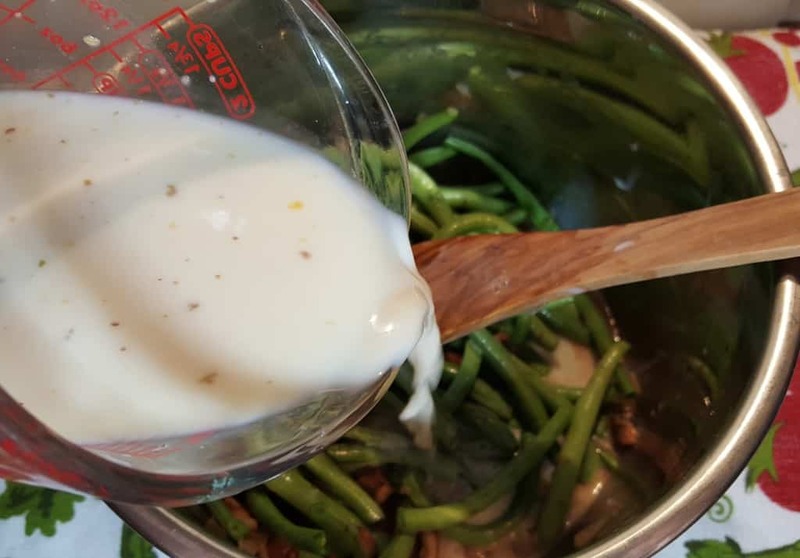 Grab a Spatula and deglaze the pot with Bone Broth, so that bits will loosen from the bottom of the pot and add more flavor to the Instant Pot Green Bean Casserole. 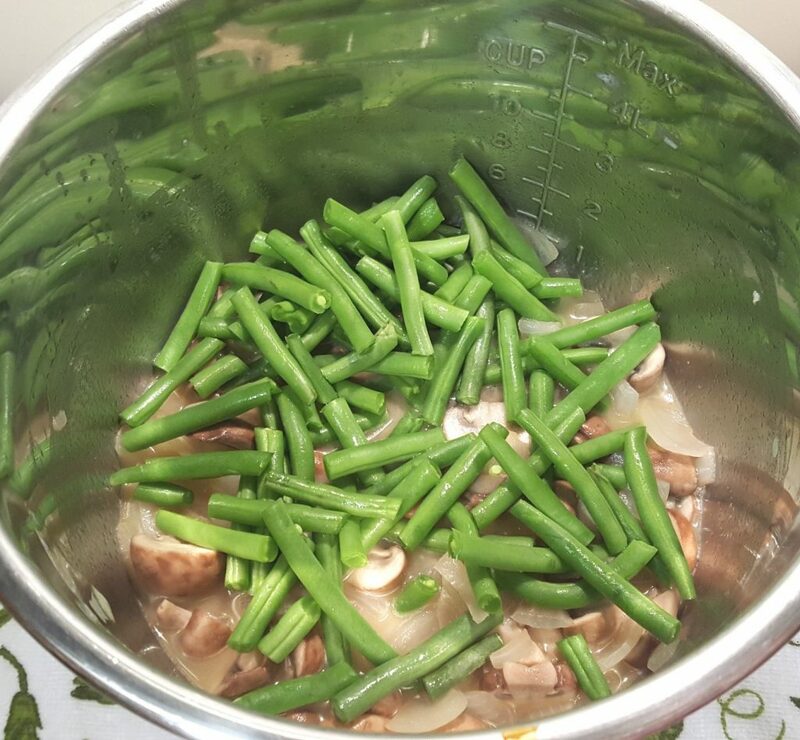 When the Mushrooms and Onions are nicely cooked, add in the green beans. Make sure to trim the ends of the beans. Green beans can be added whole or chopped. 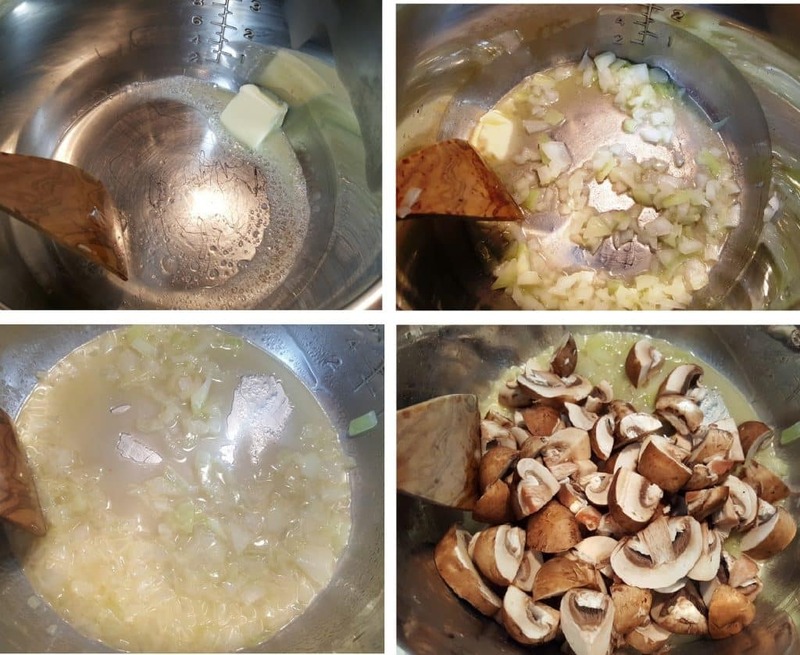 Pour the Soup Mixture in the Instant Pot, Mealthy MultiPot or Pressure Cooker cooking pot. 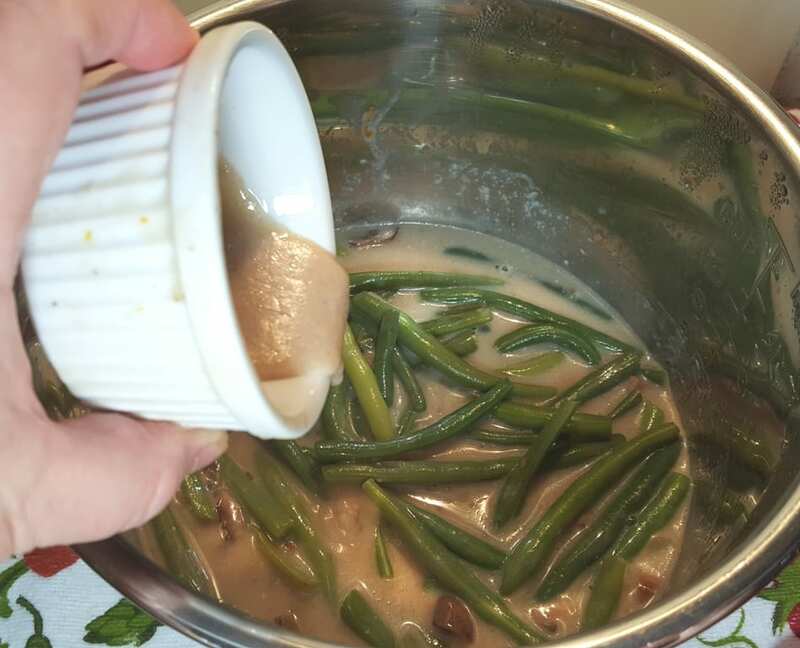 My Homemade Cream of Mushroom Soup Mixture is an excellent addition to this recipe and gives the Green Bean Casserole, a homemade tastes. Your guests will love this recipe. The Potato Starch will thicken the soup nicely and not be gummy, which can happen with flour in the Instant Pot, Mealthy MultiPot or Pressure Cooker. Mix the Soup Mixture into the vegetables and you are ready to cook. It is just a short cook, which is why we cooked the onions a bit more than usual. Since we are cooking in an Instant Pot, Mealthy MultiPot or Pressure Cooker the Broth is a bit thinner than normal. This will thicken up quickly during a Simmer. If you need to make a slurry for a thicker broth, it’s easy. Take a measuring cup and dip it in the pot and remove some liquid. Add in the Potato Starch to the cup of liquid. 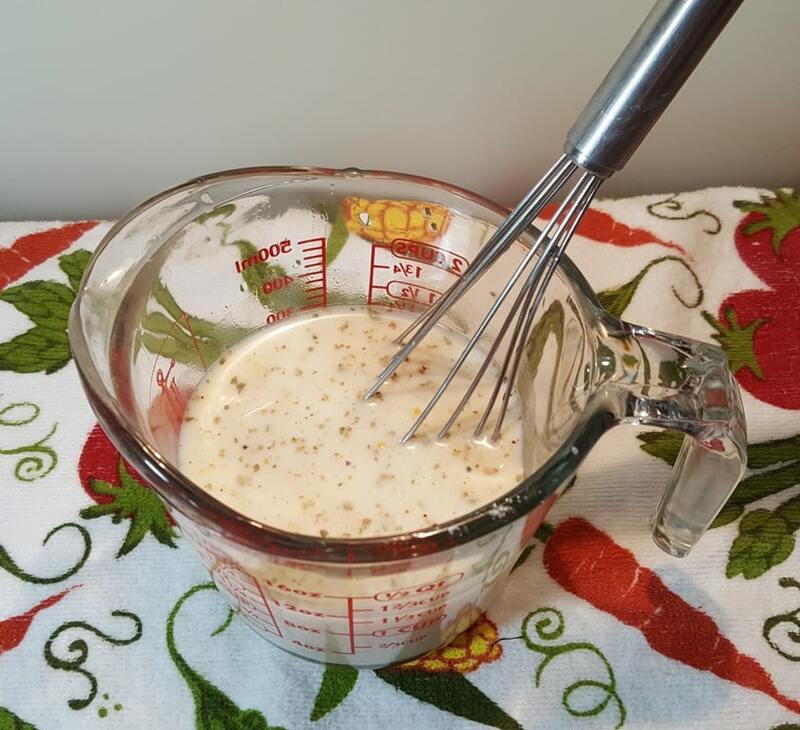 Whisk the starch completely into the liquid until it is very smooth and without any lumps. Now you have your slurry. If you want a thicker liquid, hit the Sauté or Browning button and simmer, until desired thickness. Keep a close eye on this, as it will thicken quickly. 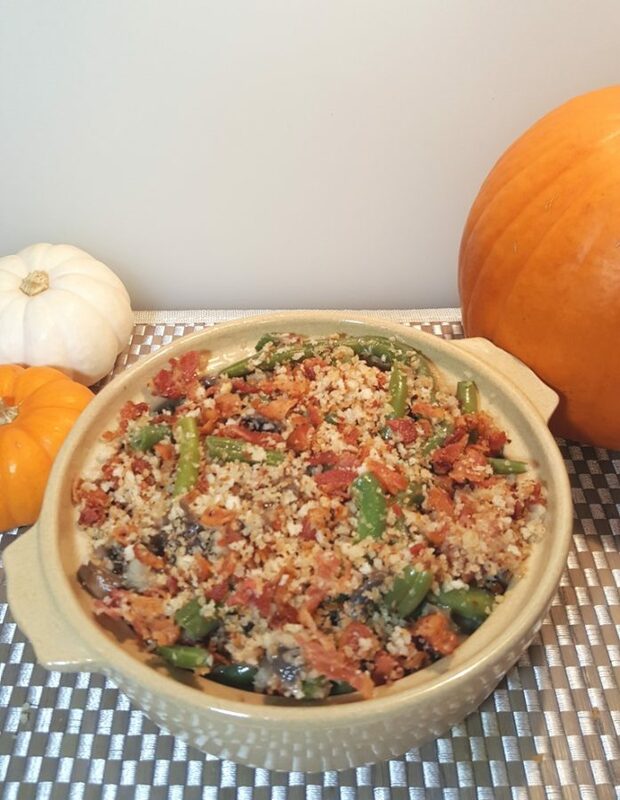 You can make this Fresh Green Bean Casserole a head and then warm and add the Crispy Garlic Breadcrumb Topping right before serving. For more holiday dishes, check out my Traditional Sweet Potato Casserole and my Pressure Cooker Orange Ginger Cranberry Sauce. More Instant Pot Vegetable Recipes to Love. 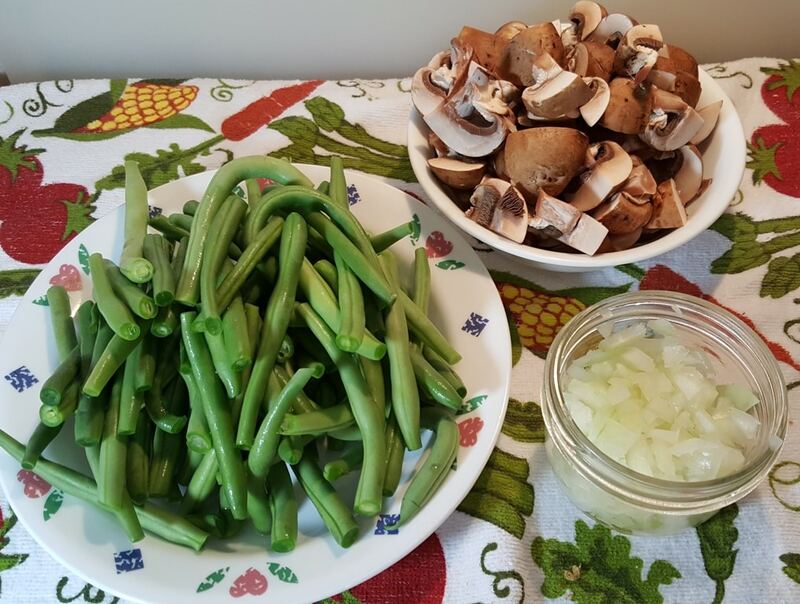 Trim the green beans and slice or chop the mushrooms and onions. Mix together soup ingredients and set aside. Select Sauté/Browning on your Pressure Cooker cooking pot and allow to fully heat. Add oil and butter to the cooking pot. 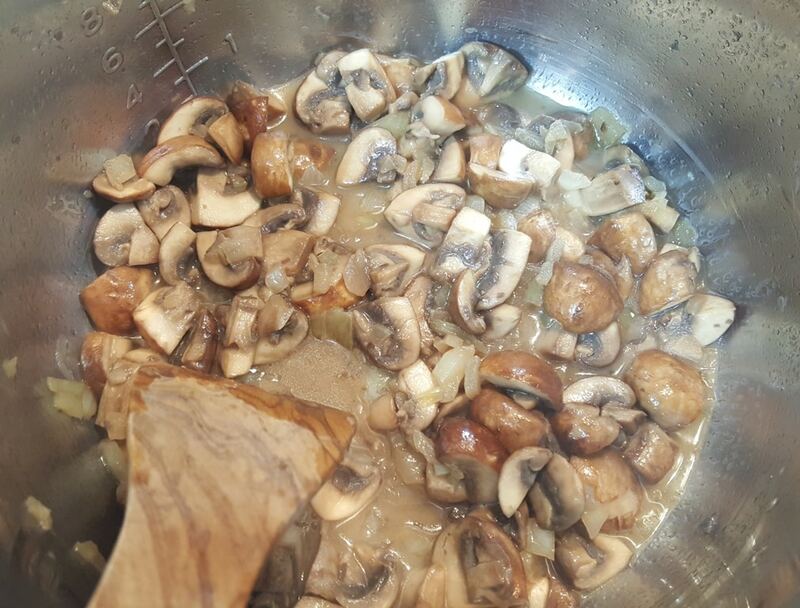 Add onions and mushrooms and sauté for four minutes, or until onions begin to soften. Whisk in the soup mix and string beans. Lock on lid and close pressure valve. Cook at high pressure for 1 minutes. When beep sounds, wait 5 minutes and then release the rest of the pressure. Simmer to thicken liquid, if necessary. Place into a serving/casserole dish and sprinkle Crispy Bacon Garlic Breadcrumb Topping on top. For a softer green bean, cook for 2 minutes. 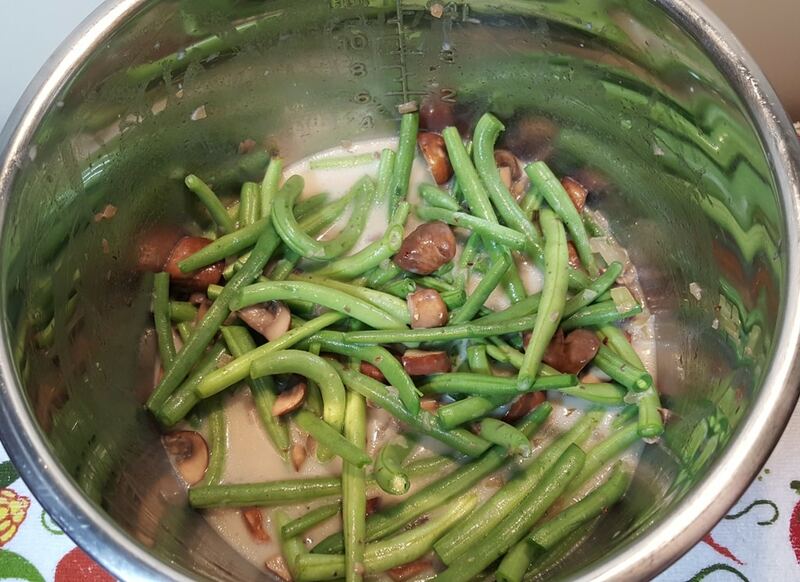 For a firmer green bean, cook for 0 minutes. Use heavy cream in place of milk and coconut flour in place of potato starch. 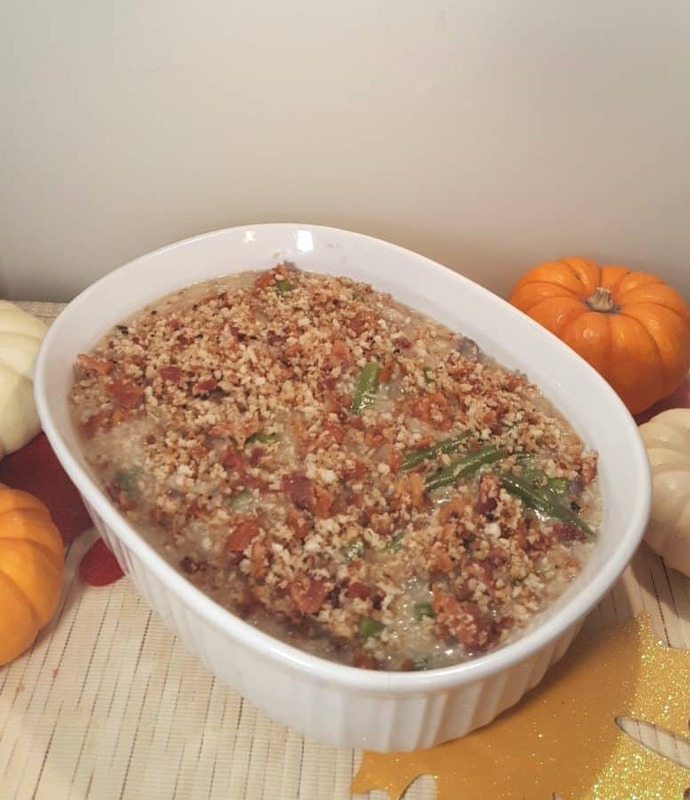 PIN this Instant Pot Green Bean Casserole! I don’t see the onion amount. Am I missing it? Hello, can I use potato flakes if I don’t have potato starch? Potato flakes are different than potato starch and I would not use it for this recipe. Corn starch will work fine. I can’t seem to find how long to cook the green beans. I’ve read it several times what am I missing? Thx! There is a recipe card at the bottom. 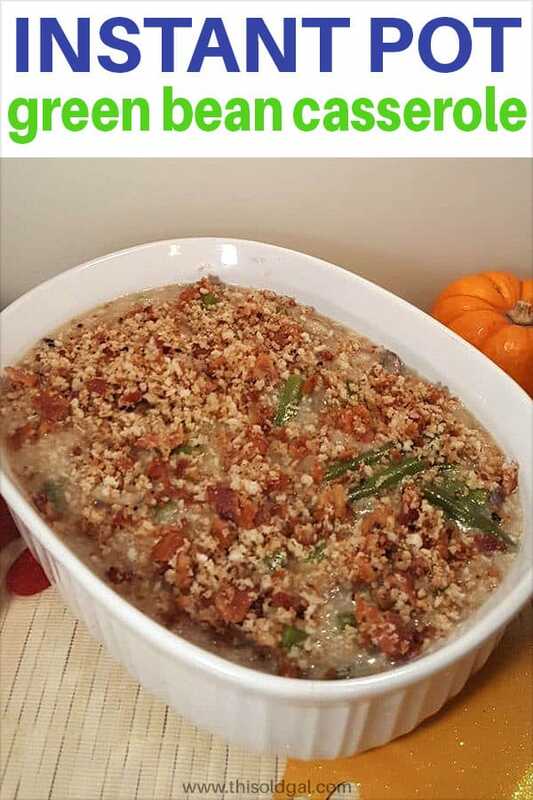 Jill, I made this a few weeks ago and I LOVED the flavor – especially the bacon crumb topping, but the consistency was bad. My beans were mushy and the milk curdled. What did I do wrong? I’d really like to try it again! TIA ??? ?